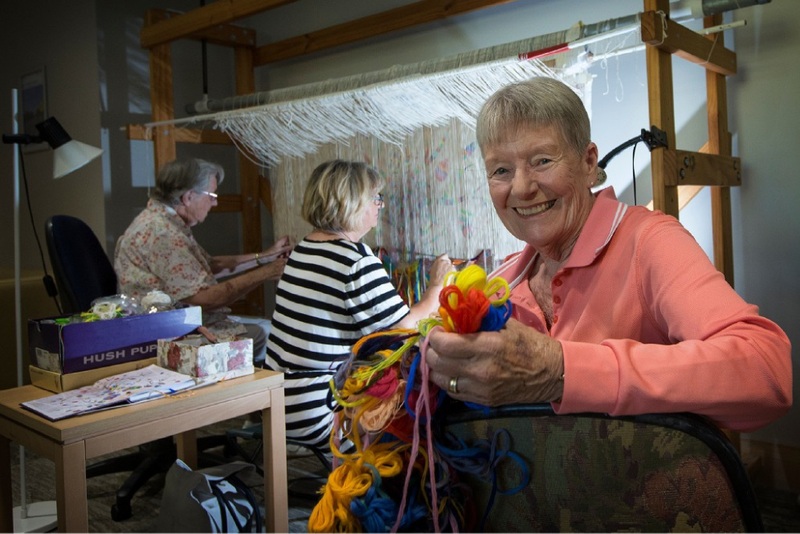 Patients waiting for surgery are appreciating the skills of three talented weavers who are interpreting an artwork by Perth painter Elizabeth Marruffo. Karen Vernard, Connie Ward and Toni Potulski have been hard at work re-creating The Pomegranate Seed since last July, which was painted especially for this project and inspired by embroideries made by the Otomi people of Mexico. Ms Marruffo said she was delighted at how the work was progressing and the effect it has had on patients and visitors at the hospital. “I feel very privileged that it is unfolding in this context and extremely grateful that the tapestry weavers are dedicating so much time and effort into realising the project,” she said. “It’s beneficial for people to be able to see art in unexpected places and be exposed to the mysterious ways things are made. The tapestry depicts the artist and the tree of life, surrounded by colourful imagery on a muted background. Curator Connie Petrillo said the project had turned the waiting room into a vibrant space for patients, who were often nervous and apprehensive before their surgery. The tapestry is expected to be completed in the middle of this year and will become a part of the hospital’s extensive art collection.